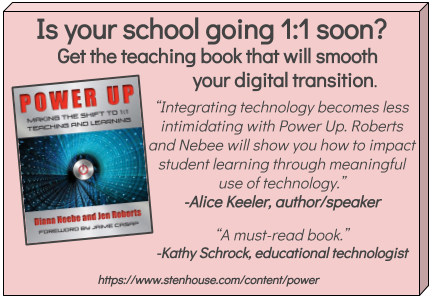 The challenge for teachers switching to digital classrooms is that we still want all of that information and it is natural to assume at first that we just need to collect those things digitally. The result though, is a separate document for every daily bit of work students do. If you thought the piles on your desk were overwhelming, just try opening 150+ new documents every day. And if you had your students turn in two things? Yikes! As students share their documents I add them to a folder for the year called English Journals. (Yes one folder for all periods. I want them ALL in one place.) With all of the docs in one folder it is simple to use the preview feature in Google Drive to flip through all of their papers quickly. (More about the preview feature further on.) When I sort the docs in that folder by name they should line up by period and then alpha, pretty close to the way they appear in my gradebook. I teach students to always put their newest work at the top of the document. This is hard for some of them at first. They are so used to working under their previous work, but after a few days they get the hang of adding new work at the top with the date. Soon they learn to appreciate not having to scroll through their old work to do their new work. This helps me too because when I look at their documents I want to see the most recent work first and I don’t want to have to scroll to get to it. I keep a chart in the classroom about what should be in their English Journal. 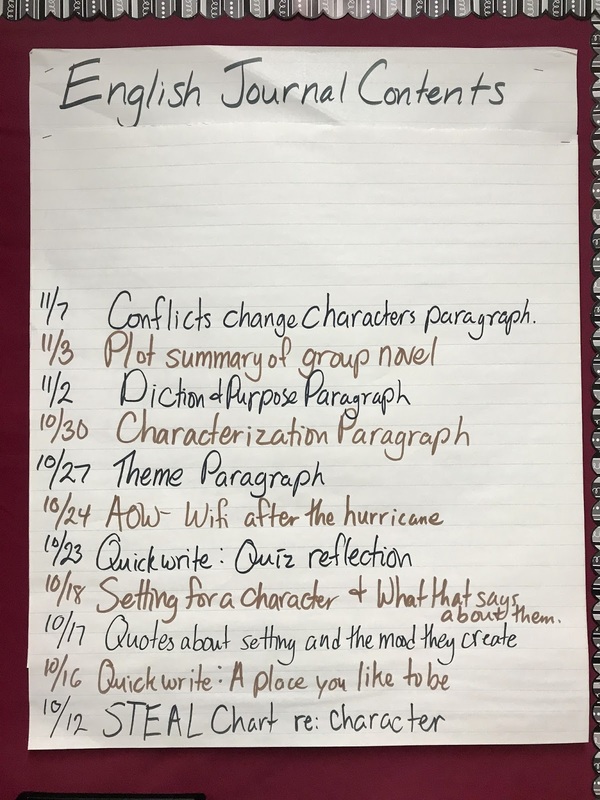 I start by adding dates and assignments at the bottom of the chart paper and work my way up, so that it mimics the sequence in their document. 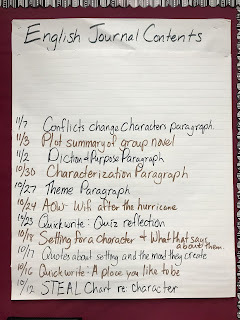 It only lists the date and title and my students know they can refer to the class blog for that date for more details. Every few weeks I ask students to reflect and self assess their work. We use this scoring guide. I use the English Journal for daily classwork kinds of things. Longer essays and projects get their own document template and I assess those separately. I use Google Forms to gather lots of student work that might otherwise have gone into their English Journal. Often gathering their work through a form makes assessment easier and faster. I will also have students put their work into a form when they are working with a partner. Usually, their English Journal is for more individual work. Using the preview button I can quickly flip through my student's work daily, faster than a stack of paper even. When I find one who needs a comment I hit the "open" button, but immediately go back to flipping through the preview. When I'm done previewing everyone's work, I go back and add comments to the 5-6 docs I opened. Because the document is shared I'm never collecting anything from the students. I'm not taking it away from them. My students can continue to access and improve their work even as I am looking at it. Gone are the days when I carted home a trunk full of spiral notebooks and tried to assess them all in one weekend because my students needed them back. My students with special needs can share their journals with classroom aides and special education teachers. This often facilitates silent support during class work. By seeing student work daily I can adjust lessons and give immediate feedback. Find the student work (or any doc) you want to view in your Docs list. It helps if all of the docs you want to preview are in the same folder. Click on the file name once. The row should turn blue. Make sure only ONE file is checked. A new set of options will appear right below your Docs search bar. One is a link icon, one is a share button, and one is an eye. Click the EYE and you should see the document you selected large and in the center of your screen. Use your right arrow to display the NEXT document from your docs list without leaving preview. To leave preview use the x in the upper right. 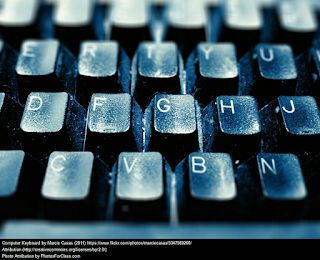 To open the doc for actual editing or commenting use the open button on the lower right. You can also print or share right from the preview page. Note: Google sometimes changes the steps for accessing preview, so these may change.